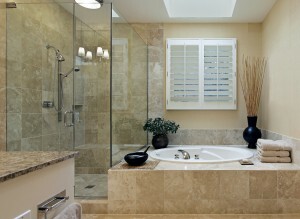 We provide a comprehensive bathroom fit out and project management service in Oxted and nearby areas. We aim to achieve the best possible finished result for your budget. Coupled with our collaborators Jane Neville Interior Design, we are able to provide the whole range of services for your bathroom project from interior design to tiling and related electrical work. We take on projects of all sizes from small cloakrooms to large family bathrooms. Supply and fit of all bathroom parts and units from various suppliers. Tiling, flooring, lighting and stonework. Custom built units and custom woodwork if required. All related electrical, plumbing and decorative work.